21. Due to the varying kinds of food and different environmental conditions the puppies come in contact with; and the fact that all puppies have immune systems that take time to mature, the terms of this guarantee will not b honered unless they are given NuVet Plus immune system builder, as directed by the manfacturer, for the entire guarantee period. Failure to do so will render this guaranee null and void except where prohibited by law. 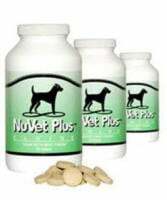 We also highly recommend you to continue to give your pet NuVet Plus beyond the guarantee period to promote optimal health for a lifetime.